Ah that sux. My son had a similar crash once as well. Bollard where bike path crossed a road was I guess intended to remind cars not to drive on the path, but really probably does more harm than good. He probably means German tourists, often senior citizens with fancy gear and poor skills. For some reason cycling in foreign countries is in a blind spot, the Dutch travel a lot but tend not to notice the lack of cycling elsewhere and not notice the exceptional amount of cycling here when returning home. It has been sinking in for a while now but we need regular reminders from foreigners that we are the exception. The Dutch aren't just the exception in helmet wearing, but in general. The people of Amsterdam are reminded daily that foreign tourists aren't competent cyclists, not only in understanding traffic but also in bike control, tourists are the main danger and disruption of Amsterdam traffic these days. Maybe the tourists should wear life vests too, with all those canals without fence and warnig signs. The Dutch have been on a bike from a very young age and almost every day of their lifes, they all have a lot of experience in taking care of their own safety and a lot of skill, especially when it comes to not falling and when falling (snow, ice, intoxication) not hitting their head. Upright bikes probably help, but I guess it's mostly about reflexes from a very young age. Besides that helmet wear would disrupt the way we use bikes here, there's also a problem with others wearing helmets. You've got to rely on your own skills, but you've got to rely on other people's skills too. If you are not skilled or careful enough to ride safely without any protection, how can I rely on your skills or care to share the road safely with you? Or have my kids share the road with you? It's not just about personal choice. I grew up in the 1960's, and 70's, and we never wore helmets when we road bikes. Nobody did. When I got back into biking as an adult, I bought a Bell helmet, and have been wearing one ever since. I am not a safety obsessed person, but I like most others think it is a wise measure. I have seen people on club rides fall due to dogs, and other issues actually break their helmet when they went down, which saved their head. Now, I don't bubble wrap myself either. In some ways our society has moved towards wanting a risk free lifestyle. Not going to happen. Last edited by Pilot321; 07-12-18 at 04:45 AM. OP, you are Lucky! I can't believe you lived! Hmmm......maybe A&S lied to me. You've got to rely on your own skills, but you've got to rely on other people's skills too. If you are not skilled or careful enough to ride safely without any protection, how can I rely on your skills or care to share the road safely with you? Or have my kids share the road with you? It's not just about personal choice. Indeed. Won't somebody please think of the children? If the Dutch have such great reflexes, why aren’t they in the World Cup final? I grew up in the 1960's, and 70's, and we never wore helmets when we road bikes. Nobody did. Hmm. I had a paper route in the early 80s and I can't even remember if I had a helmet. I'm thinking probably not. Nowadays I will ride helmetless to the park with my kids, and make them wear helmets. I tell them it's just the law (which it is). When they're adults they can choose when to wear helmets. I have ZERO worry about crashing and hurting myself. If it happens, oh well. But I have full confidence in myself that I can ride for mile after mile without crashing the bike. The reason I wear a helmet anyway is because I do not have that same confidence about drivers, other bikers, pedestrians staring at their phone, etc etc etc. My helmet isn't in case I crash. It's in case someone else crashed into me. I'm old enough to have grown up without helmets, so my perspective is probably effected by my age. I don't bother to wear a helmet when running errands, or sporting around my tiny sleepy rural village, which gets very little motor vehicle traffic. On a Sunday evening, I can ride for an entire hour, and maybe encounter one car passing me, or perhaps a piece of farm equipment. I never wear a helmet when it's over 85 degrees, because it feels like I'm stuck in a toaster oven. I do normally wear a helmet when it makes a lot of sense to do so, such as my 30-mile round trip commute on a state highway. Tractor trailers sometimes pass me, and motorists who are more interested in their smart phones and than the safety of cyclists. If you ride bike without wearing helmet there might be a risk. So you need to ride bike to wear a helmet. I live in a beach community. 98% of the people don't wear helmets and I don't see bodies littered all over the place. I'm a live-let-live kind of guy. If you want to wear a helmet, wear one. If you don't, don't. What makes me angry is the people who do, reprimanding someone who doesn't. I've noticed it's mostly women. I've threatened a guy or 2 that if he doesn't shut up about me not wearing a helmet I'm going to run him off the road. People need to mind their own business. I have taken to ditching the helmet for errand rides, no more than 1-2mi down our main street with bike lanes, wide empty sidewalks, many stoplights and 35 mph speed limits (posted anyways), so traffic is pretty calm. Especially at the times I'm out running errands, which is not rush hour. Always nice. My commute though is along bigger, faster roads, full of cagers hellbent on 'winning' the race they seem to think they're in. I admit that probably there's only a negligible chance I'd be in an accident where a helmet would make a difference, but it certainly doesn't hurt anything to wear it. For what it's worth, the one time I actually needed a helmet was right at the end of my street. Cracked it clean through. Weird things happen. In my perception, the Dutch exception is this: They're riding upright city bikes, versus drop bar or flat bar bikes. If your posture puts you over, or just behind, the steerer, you are much more likely to endo over the bars if you suddenly stop for any reason, while someone on an upright bike, well behind the steerer, can brace against the handlebars without going over them. The other thing is that the average bike ride in the Netherlands is quite short; I've heard under three miles for most rides. Here in the states they tend to be several times that, which means, compared to the Dutch, we *do* look like we're in a race since we need to cover more distance. If they're riding beach cruisers, they're also part of the Dutch exception. Let me dignify that question with a serious answer. I can think of many wrong Dutch reflexes when it comes to the national football team, but the question should of course be why such a small population knows so much success in important international sports that people wonder where they are when they didn't qualify. One of the reasons is that Dutch kids don't need 'soccer moms' to play football or another sport. The bicycle makes them independent, they can go anywhere to play or train by themselves. I guess cycling is just one of those things people get very good at when they do it daily from a very young age to well into their teens, also the people who are clumsy in many other things. They don't fall off because of bumps in the road or something and if they fall off, because of texting on icy streets while drunk for example, they don't hit their head. It becomes second nature like walking. I know it sounds lame, kids are often used as an argument against things adults to want to see. But the kids have to start young and I have no kids myself but I am in traffic with 4 and 5 year olds. If that environment isn't safe enough for experienced adults without helmets, it's not safe enough for those kids, with or without a helmet. Those kids got to be there, otherwise traffic will be a mess in 10 and 20 years. Here’s an article that discusses the issue of Dutch helmet use. No mention of catlike reflexes. It appears that transportation cycling in Nederlands is more like walking. You're not mixing it up with other traffic, you're not going very fast, you're wearing street clothes, you're using well-maintained dedicated roads/sidewalks. Nice to hear from someone who has cycled for a while in the city I live in and the author means well, but gives the wrong impression on a few points. The Dutch people he quotes are actually debating global cycling with foreigners, not Dutch cycling. There is no Dutch to Dutch helmet debate, it's just not a subject that is debated here between Dutch on Dutch cycling, Dutch cycling safety debates are about absence of lights, mopeds, texting riders, elderly on fast E-bikes, Eastern European truck drivers and earplugs, not about helmets. They give (good) reasons why they don't wear helmet, but these are invented for the sake of the debate, it's not like they reasoned like that before they decided not to wear a helmet, because that decision has never been there to make. They also give good reasons why it shouldn't be policy to encourage helmets but that's not the reason behind the policy, the reason is that the politician proposing it would be ridiculed as a nanny state fanatic out of touch with reality. If you touch their cycling habits you touch their sense of freedom. They are all anarchists on the bike, they don't obey rules because they have to but they obey the ones that make sense, often. And as every helmet debate, because the helmet is the only thing for safety in a crash, it holds the suggestion that the helmet is the difference between beeing safe in a crash and not beeing safe in a crash, which of course it isn't. It's not about catlike reflexes, it's about the right reflexes. Jeanne Misner commented: "If the adult driving the bike hit a pebble or tripped up somehow, and the child fell to the pavement, he could have a serious head injury. It would make sense to protect the children." You don't hit a pebble or trip up somehow. Jim Gordon backed her up: "One little twig that rolls, a wet plastic bag, an ounce of sand, a few wet leaves or a front tire blowout - any one of these things can slam you down to the pavement incredibly fast during a turn. A front tire blowout slammed my head into the pavement and cause a double shoulder separation. Without a helmet I would have been in a head trauma unit with a half million dollar bill." I'm not going to discuss the American health care system, but this is an incompetent cyclist. Can't have someone like him cycling on Dutch streets around cycling kids who still got to learn. They'll learn that they can run over little twigts, an ounce of sand, that wet leaves and plastic bags can be slippery but a front tire blowout is no reason to go down. tony did as well: "Agree re helmets. A few years ago I skidded on a patch of mud and cracked my head on the kerb. Fortunately I was wearing my helmet (which cracked) and since then have always worn a helmet. It was the temple area which hit the kerb, directly over the middle meningeal artery and if that pops, it's probably curtains." How can you skid on a patch of mud? Wasn't it visible? Did you panic and hit the front brake while trying to steer around it? And why land on your head? It's about active vs passive safety (very limited passive safety), like learning to swim instead of wearing a life vest near water. If you become a good swimmer during childhood, you don't swallow a lot of water when something unexpected happens and you fall in, you just swim to surface and breathe there, and use your limbs to keep your head above the water, that's a good reflex. Not catlike, not superhuman, not genetically Dutch but just trained at a young age. You don't go there where the current is too strong, you don't dive in shallow water head first, you know what you can and can't do and that makes you safe. Yes it is like walking, only at higher speed. Often leisurely, but also 20-25 kph. Sidewalks are used, but usually only at pedestrian pace. Infrastructure is usually wel maintained, but you can't remove an old tree just because the root has caused a bump in the cycle lane. Wet leaves don't get removed immediately, little twigs are common in the autumn, it's branches often, plastic bags are rare but that's for other reasons, there's snow, ice and sometimes black ice. After roadworks they use the cyclists to push the gravel firmly in and make it settle. Sometimes people don't pay attention and fall because they brake or turn sharply on that gravel, like a friend who had a serious shoulder injury for months, but she didn't hit her head. I finished a bike ride off last Sunday with a trip in an ambulance. My accident happened when I hit a rock or a root, riding at no speed, on a fairly level trail I've ridden quite a few times before. There's a dent in my helmet, not a big impact, just a smallish dent and a bit of a mark in the coating. Did it save me from concussion, fractured skull, brain injury? 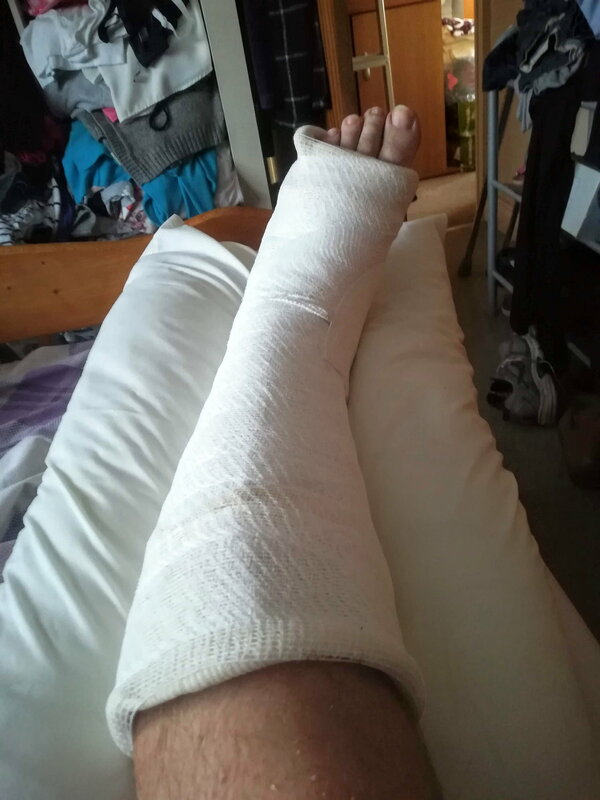 No way of telling, but I was home the same night - albeit plastered and on crutches - with my family rather than occupying a much needed hospital bed. Talking to the ambulance crew and the staff in A&E I got the same impression throughout - they were very pleased I'd worn a helmet. I heard several first hand accounts from medical staff who'd had to deal with the aftermath of brain injuries, including dealing with the cyclists' families. So, yes, it is a free choice. But - and I really hope this never applies to any of you or your families - if you have to be scraped off the road or trail and patched up by your local hospital wearing that helmet can make everyones' lives much less unpleasant. Last edited by ExPatTyke; 07-13-18 at 02:05 PM. Ruh-roh... do you know what a "dog pile" is? You may soon find out because THIS topic is only slightly less contentious than chain maintenance! When I go shopping, I usually just keep my helmet on !!! I wear a wet towel over my head most of the year (we have sun almost everyday here), baseball cap over the towel with my huge HubBub Mirror attached to the cap, then my helmet over the cap. I do get some strange looks …. Some people even ask what's that "thing" ? They are referring to my "HubBub Mirror" !!! I even keep all of my headgear on when I'm in the bank. I'm surprised security has not asked me to take off my helmet ….. I always wear a helmet !!! And my HubBub Mirror, which is a life saver too. I've heard stories, some personal, of people who would most likely have died, or ended up severely handicapped, if they had not been wearing their helmet. I also want to be a better example for others, especially young children. I work at many different schools, and so thousands and thousands of children (and many adults as well) see me cycling to work and all over town. I hope that I never have a serious accident … but at least wearing a helmet will offer protection to my head. I pretty much feel the same way. I am confident with my cycling ability. It's the other people, mostly motorized vehicles, that I'm very concerned about. I see so many people driving cars looking at their cell phone, not paying attention to pedestrians or cyclists. Very scary indeed … !! !